I'm so thankful each year when I see my gardens and shrubs come to life each spring. This is a very cool morning (50º) and I am wearing a jacket while taking pictures. We've gone from 95º on Memorial Day to a moderate 65º during the day- crazy but that 95º was especially warm for us at this time of year. 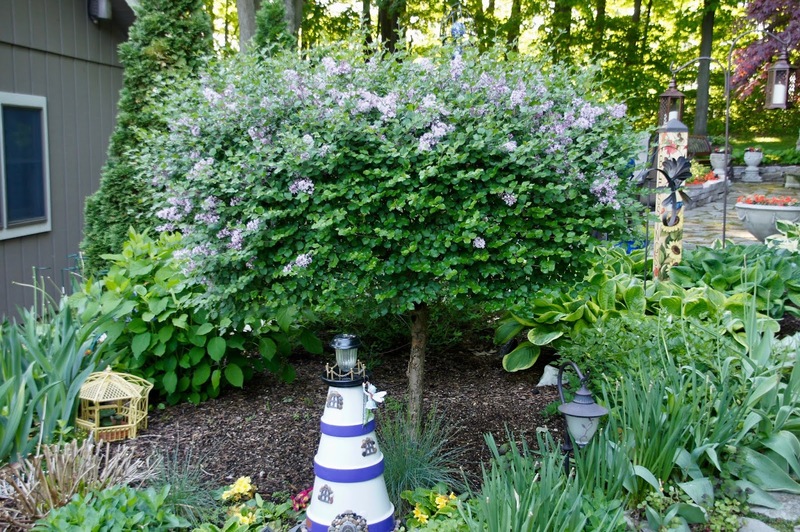 My Dwarf Korean Lilac topiary tree is blooming. It's always late compared to the traditional ones but man the scent is so amazing and worth waiting for! Some years it's loaded with flowers but others it's light on blooms. This was it in 2016! This is a scratch 'n sniff photo- try it! (LOL) Seriously it has the best scent of any I've come across. Below is my Clay Pot Lighthouse I created last year- here is a "link" to last year's post showing how it was created. Jasmine is working her way to the top to clean the light! These are the most basic hostas and you'll find them often at garden centers- the tag reads Hosta undulata variegated. One spring many years ago I dug a bunch of them up, split them and added them here- the rest are over by the bench. They can take a good amount of sun and of course they love shade. On the other side of the path more hostas and some Jack Frost Brunnera which didn't produce many flowers this year. The tulips are still there - it's hard to leave them to die back- I want to chop them out of the way but it nourishes the bulb so I'll wait a few weeks. This is a double primrose that came back nicely. I need to add more. They come in some pretty colors just have to find some! These are still developing and will fill in to the point that you barely see the ground anymore. I believe the one in the center is "Captain Kirk" and the two on the left are Blazing Saddles (gotta love the names some of these have!). I believe these hostas with the heavy white edges are called Minuteman. These are always impressive but they do show signs of stress easier than some others. They like to be kept well watered when it's hot. I transferred "Empress Wu" over here a couple of weeks ago. Someday she could be 5' wide! The leaves are absolutely huge! 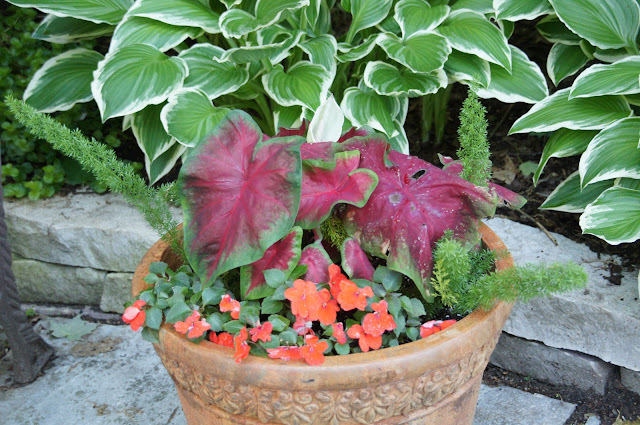 It needs plenty of water and does take time to develop into a larger plant. I looked down at the planter and saw a surprise! 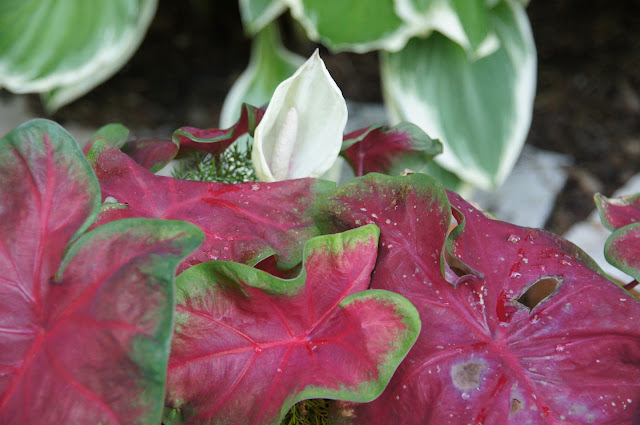 The caladium is shooting off a flower! First time I've had this happen! I'm sure it was brought on from the temporary heat wave we had. I brought out the old wagon and loaded it up with flowers. 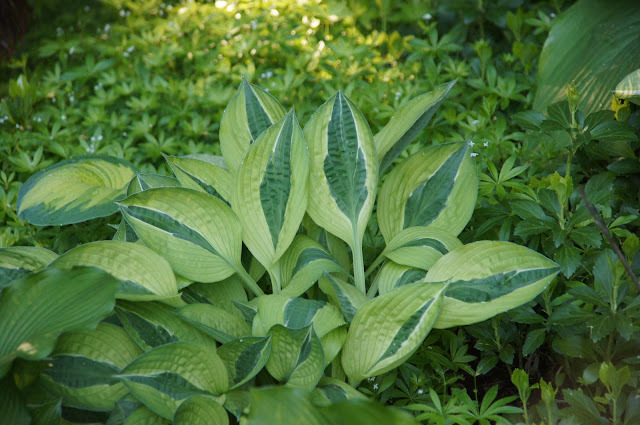 Sum and Substance hosta. 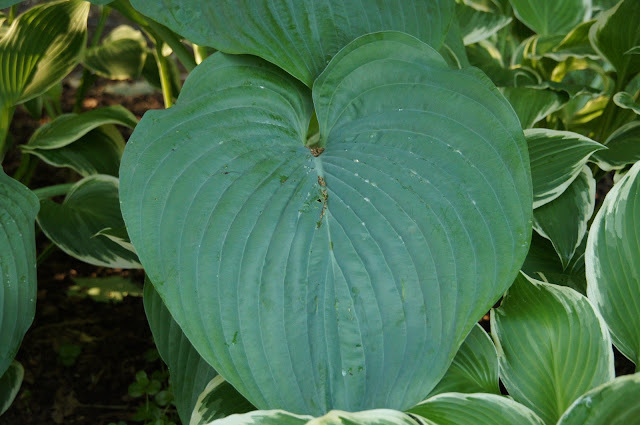 If you want an impressive very large hosta that's easy to grow I recommend it! I'm not positive but I think this is a hosta called "On Stage"
This one is called "Striptease"
This hosta is called June- one I've often seen at garden centers. I like it a lot and they are usually inexpensive. When we installed this part of the patio with the fountain I split up a bunch of hostas and planted them around the circular potion. These are called Gold Standard. The little plant growing below is Sweet Woodruff (loves shade). 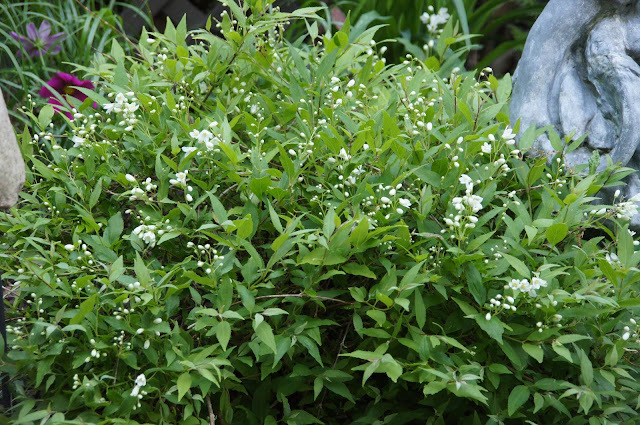 It produces a little white flower and spreads easily. 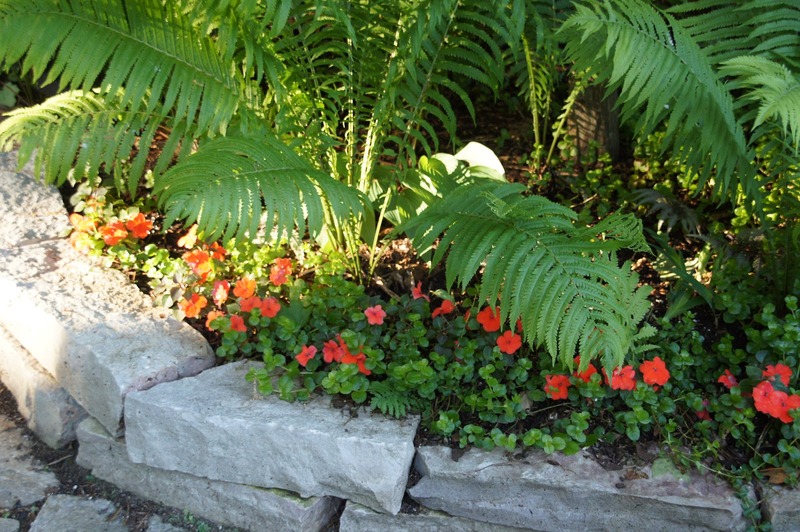 The orange impatiens have started to fill out. Hiding in there is a "painted fern". 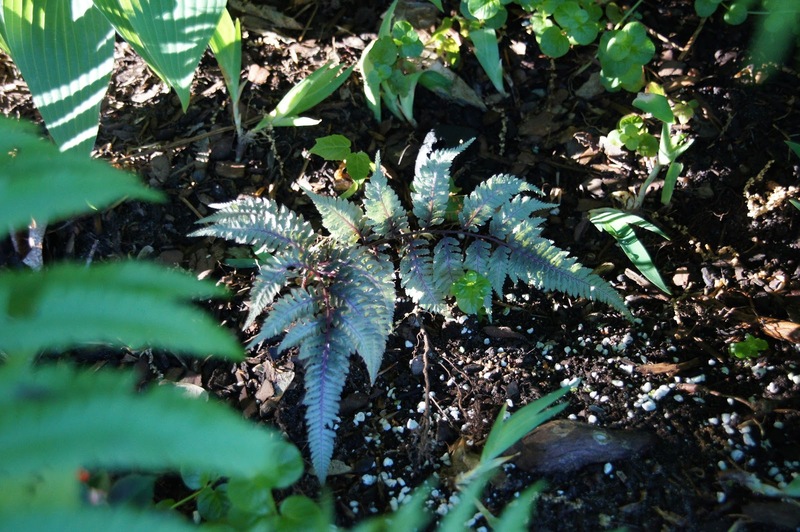 I thought I transplanted them all to the new little Japanese Garden I started last year. Always fun to spot a surprise! 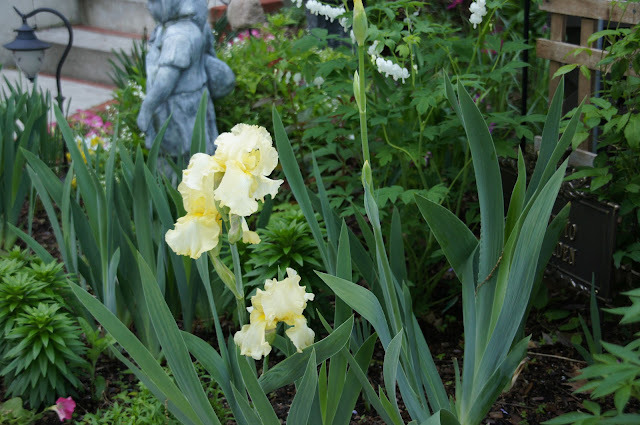 Back by the deck my bearded Iris are starting to bloom. This is such a pretty soft yellow one. 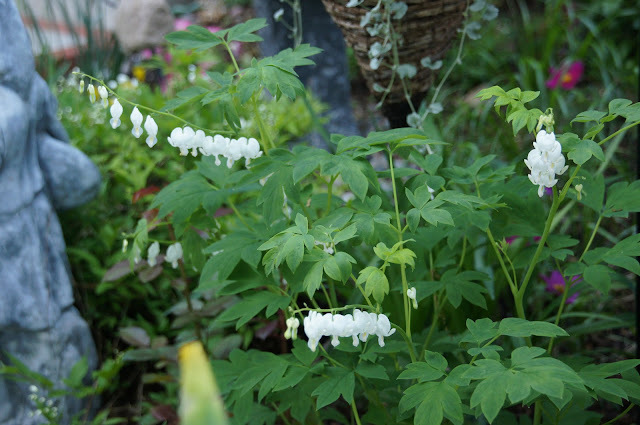 I planted this bleeding heart last year (thought I got the traditional dark pink/white one). It came up nicely so I guess It's happy where I planted it! This little shrub is a favorite. There are a pair of them but the other one got half eaten by the voles during the winter. Deutzia Nikko. I've learned they like to be well watered especially in the spring as they get going. I've seen these absolutely covered in flowers in warmer zones. 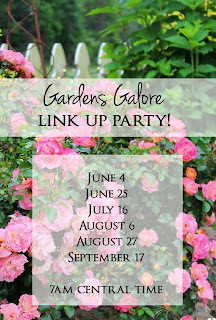 Everyday Living for her Gardens Galore garden party! Her gardens are spectacular and always worth a visit! I always enjoy visiting your gardens, Liz. 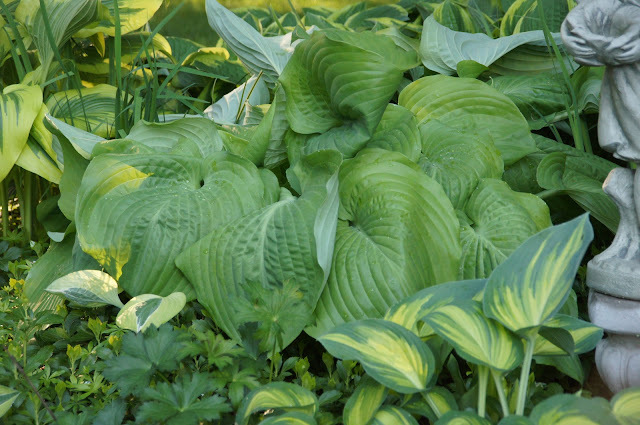 All of your hostas look great. Love your lighthouse. I'm going to take a look at that post. I'm still working on my bed around a big trees in my backyard. It has been a work in progress for two years now. Take care. 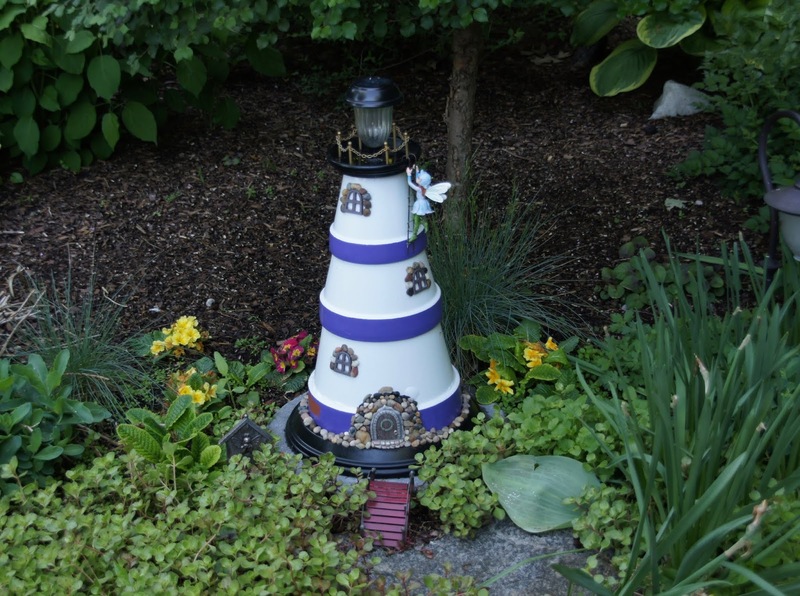 Thank you Judy- the lighthouse was fun to build. I hope your hostas do well. I have one bed of hostas around a tree out back. They do pretty well with little attention. Thank you Zenda! 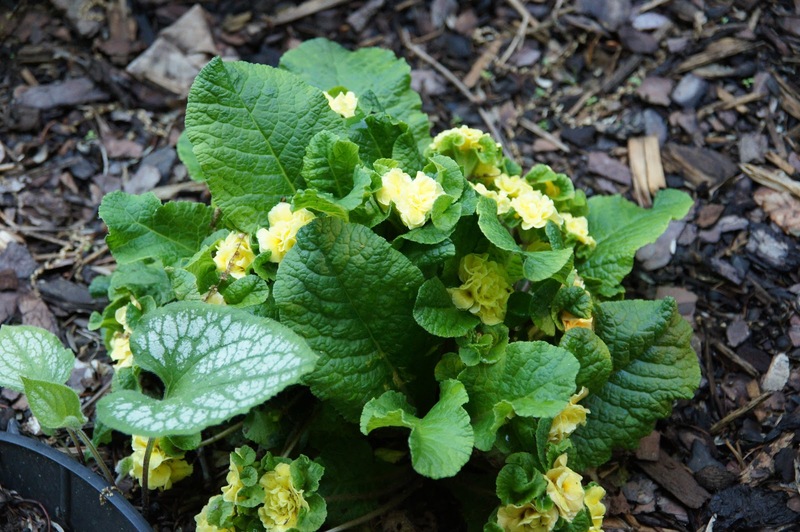 My primrose are in part sun and shade. I’ve read that in a cooler climate they can take the sun but in hotter climates they will need shade. 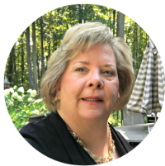 Thank you Martha Ellen! I wish we would get more rain. We get little bits at a time but it would be nice to get some soakers! 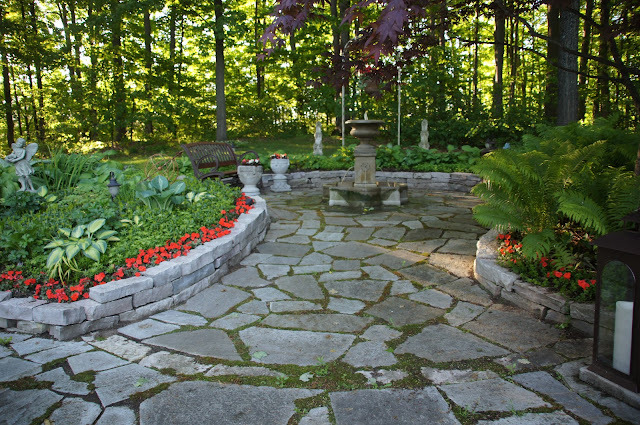 That stone work was definitely a labor of love! How beautiful! I was in TC a couple weeks ago and it went from rooftop dining one day to chilly and rainy the next. Typical up north Michigan, right? Yes how classic is that to have up and down weather like that up here! Thanks for stopping by Vicki and I hope you are still loving Florida! Liz, your garden is gorgeous. 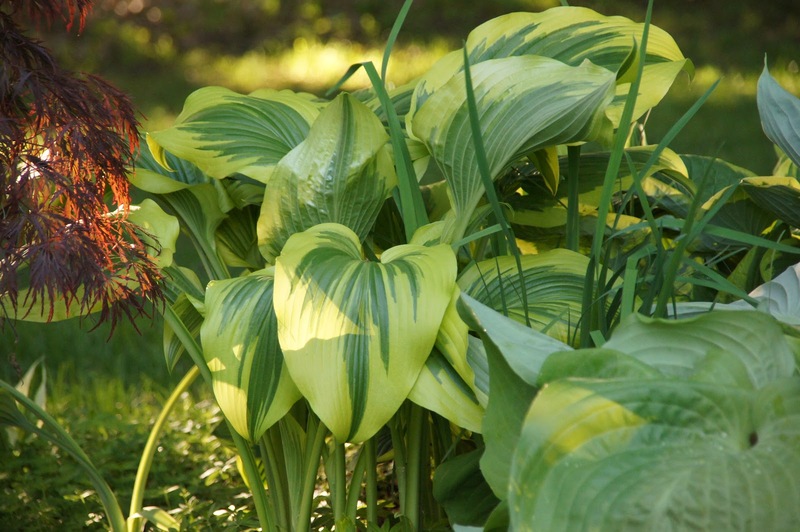 I am envious of your hostas, they are so pretty. I had them for a few years and then gave them away. They would start out lovely and then some dreadful insect would get after them and they would look terrible for the remainder of the summer. 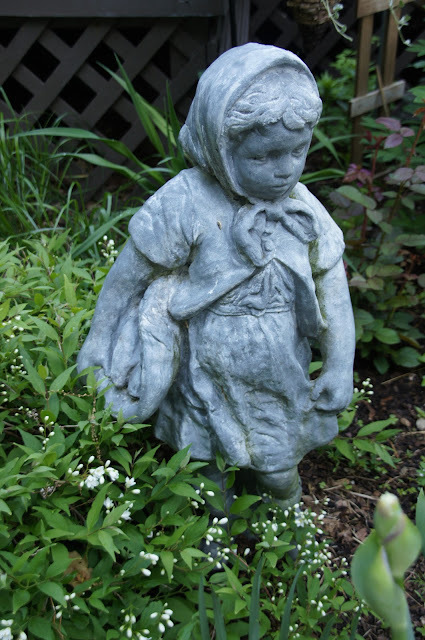 Your stone work is lovely, as is your white bleeding heart. 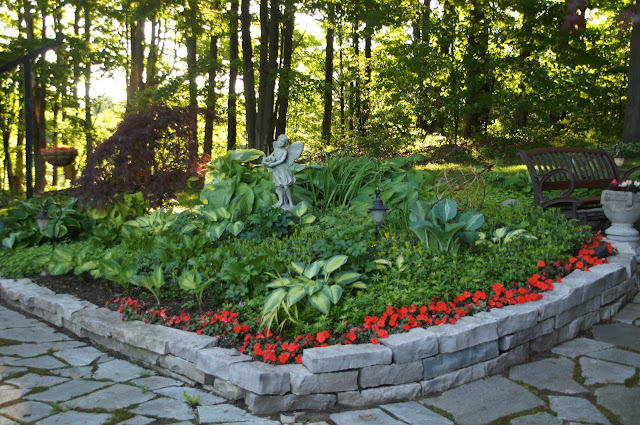 Your garden looks so peaceful to simply sit and enjoy! Thank you so much Sandra! That’s too bad about the hostas. There are products to put out to help prevent the slugs that get on them and chew holes everywhere plus last year I learned that if you get some lime and pour a ring around the plant the slugs won’t cross it. Liz, 50 degrees in the morning sounds delightful! We were in the 90s but cooled down to the 80s this week with a drop in the humidity for which I’m thankful. I’m swooning over your lilac, so beautiful, I wish we could grow them here! 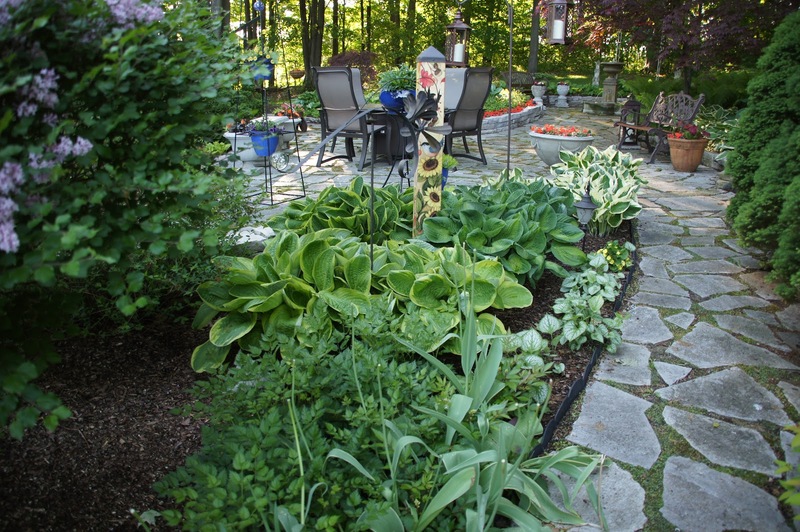 Your garden looks so cool and refreshing and I love the variety of hosta you have. I know what you mean by the tulip foliage. I’m currently looking at the daffodil foliage laying on the ground, needing some mulch to cover it up! Thank you Mary! 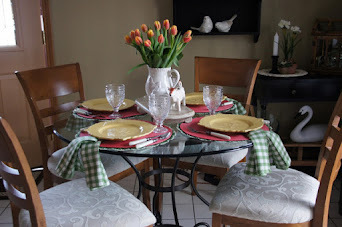 It’s so hard not to cut the foliage off of the tulips and daffodils isn’t it! Your garden is gorgeous! 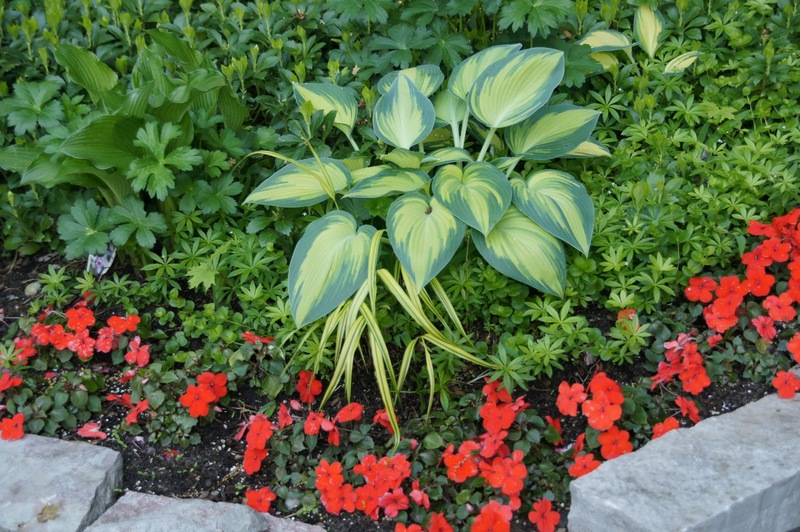 Do you plant the same hosta in groupings or do you scatter them? 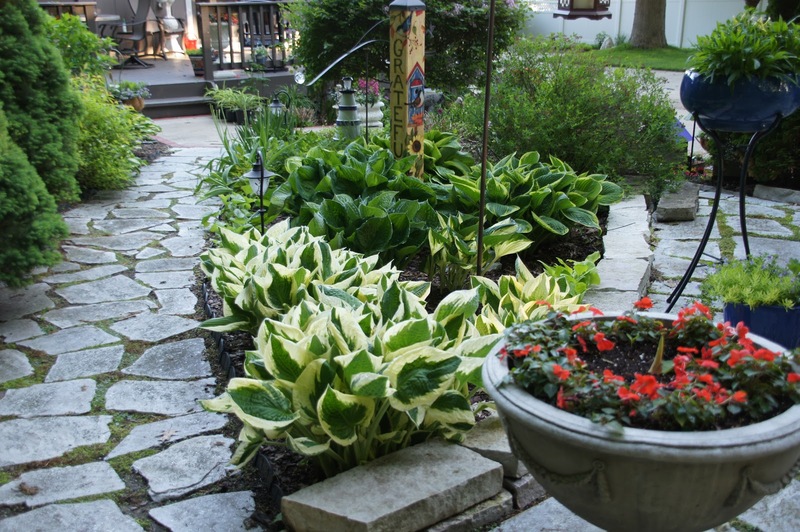 I love hostas and am redoing my gardens -- just wondering what makes the most impressive display. Thank you! Thank you Dana. 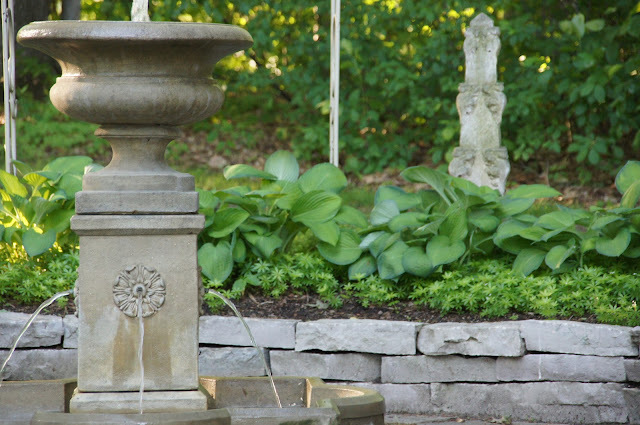 I have many hostas planted randomly but then around the fountain I used all the same ones to make an organized display. Read the labels as to how large or small they are expected to be. It can be quite a surprise when you buy a little plant in a 4” pot and then it turns out to be 36” across some day! Your gardens are coming along beautifully, Liz! It's always a delight to see what you have growing. 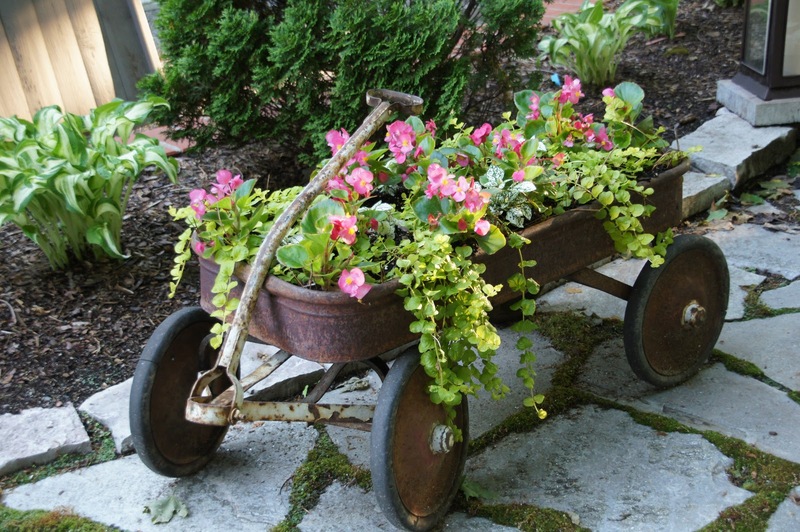 I love how the flowers in the wagon look - especially with the overflowing Creeping Jenny! It's all so pretty! Thank you Gail- It will be fun to see how the Creeping Jenny will look as time goes by. I don’t imagine I’ll be able to move the wagon anymore once the plants take off! 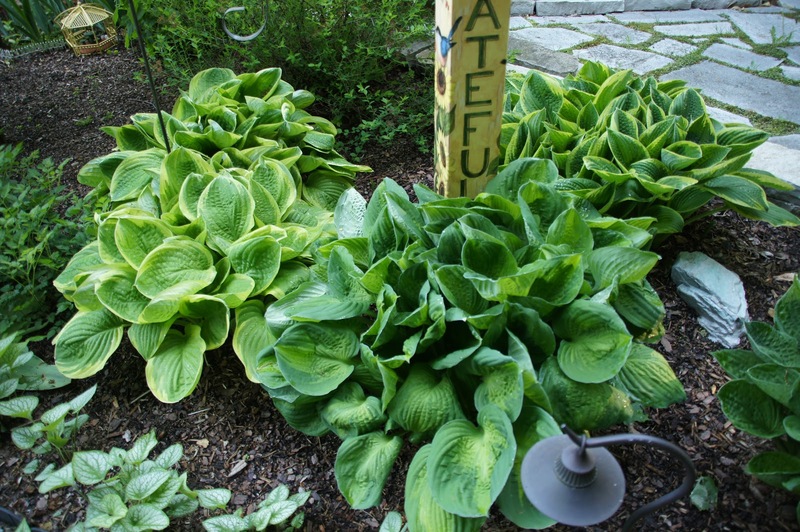 Wow it sounds like you have a lot to contend with going after your hostas. I did use a product last year that helps resell the deer and rabbits. I never had another attack after I put it out so Im assuming it worked. Too bad about the basketballs from the neighbors- what can a person do! All your garden flowers and plants look wonderful. 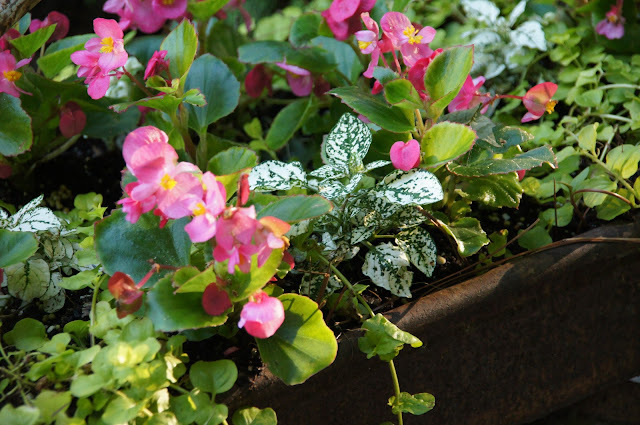 Shows your green thumb for sure. Love the little vintage wagon filled too. So cute. 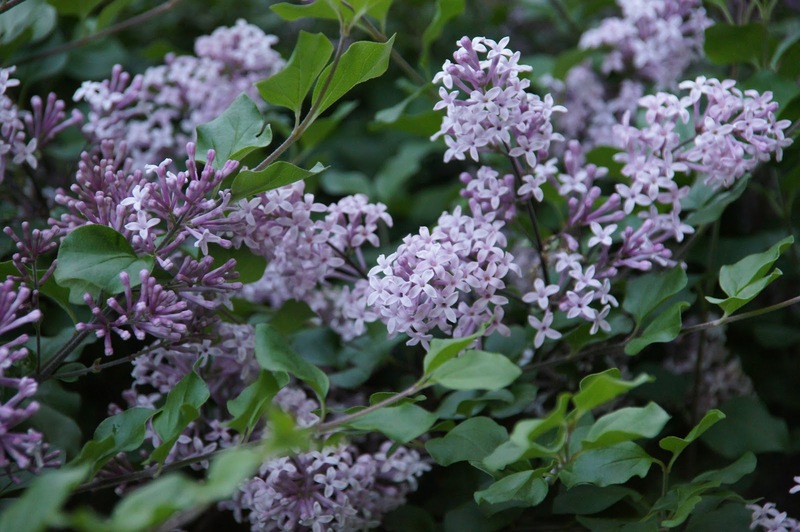 I love lilacs they are my favorites. I want to plant one under the windows of the bedrooms in the new house. I love that scent coming in the windows when they bloom. 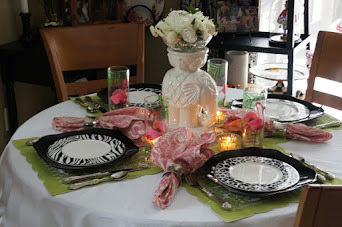 I featured your fairies garden on my post last Thursday, Gardens Galore Sampler! Your garden is just spectacular!! 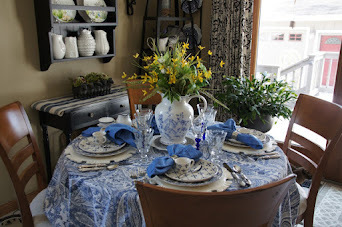 Love it and I adore the clay pot light house! 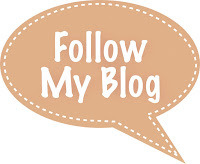 I am jumping over to the link you provided on how to make it....Thanks so much for stopping by! 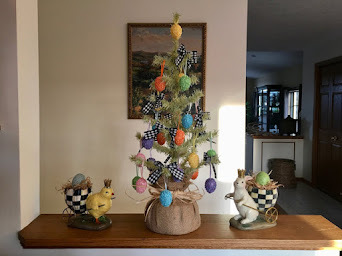 Thank you Debbie- with your creativity I know you'll make something cute! 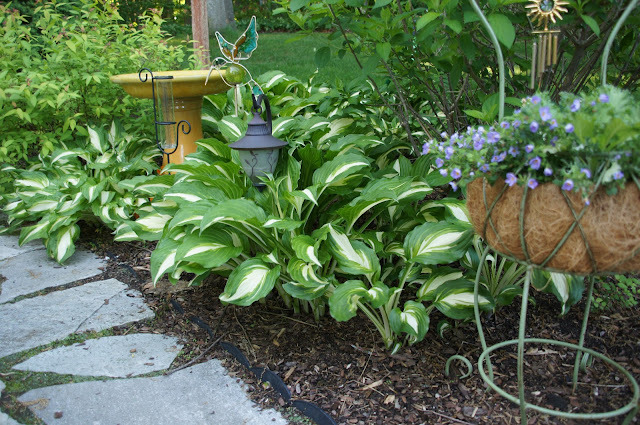 Love hostas but so do the deer! We struggle every year to keep spraying deer away on them (which works), but then it rains and those darn deer get to one or two before I can reapply. Yours mixed with flowers are just lovely. I hear the deer can be a real pain. My son lives close to you and they’ve got a lot of deer activity. 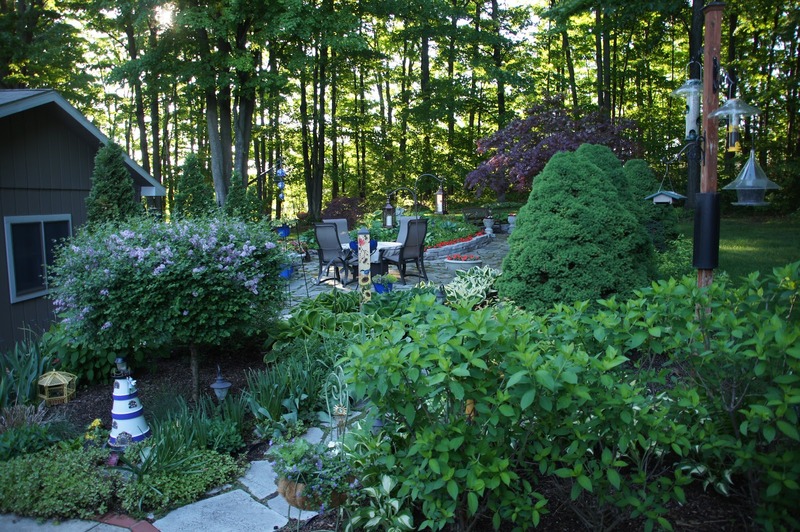 Your garden is so beautiful - I miss hostas and lilacs here in Florida. It's just too hot for many of your lovely flowers. So many beautiful hosta varieties! And that lilac! Just gorgeous. I am so impressed with you creative light house. I enjoy your fairy garden! Enjoyed your post today. Liz, have a blessed week. Thank you Bonnie- there are so many kinds of hostas to buy it’s downright addicting! 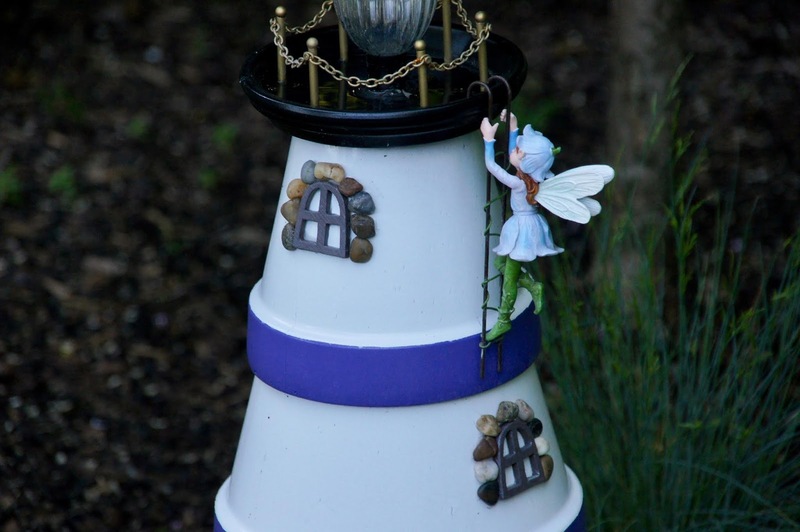 Glad you liked the lighthouse- it was fun to build and the fairy added some whimsy! 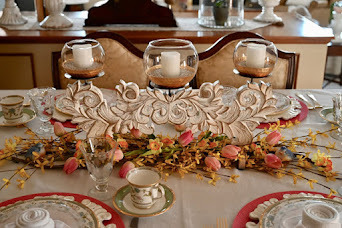 Thank you Linda- isn’t it amazing how the gardens come to life after the long winter and tons of snow my area gets! ve had 90 plus weather all week. tomorrow and Monday we are getting a cool down into the y0's. Afer that, it's right back up into the 90's. I'm sitting out in my garden now watching the sweetest birds on my Tri color beech tree. They both just flew into a birdhouse I have on a pitchfork below it. First time a bird has nested inside. I am thrilled. They are such a tiny and darling little bird. Wish I knew what the were called. 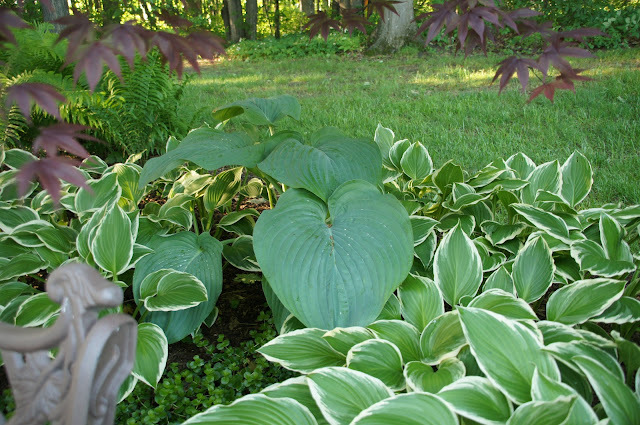 I love hostas! A few years ago I ran across the June hosta. I had to buy one for myself and all of my sisters. Our dear mother was named June. I love that you found the hosta June and shared some with your sister’s in memory of your Mother’s name! Your gardens are always so beautiful Liz!....I envy your Lilacs!!! Wish I could have them here! !